Lucy thought that she had never been in a nicer place. 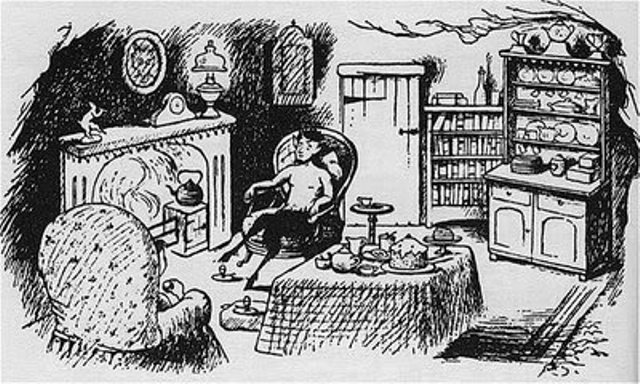 It was a little, dry, clean cave of reddish stone with a carpet on the floor and two little chairs ("one for me and one for a friend," said Mr. Tumnus) and a table and a dresser and a mantelpiece over the fire and above that a picture of an old Faun with a gray beard. In one corner there was a door which Lucy thought must lead to Mr. Tumnus's bedroom, and on one wall was a shelf full of books. Lucy looked at these while he was setting out the tea things. They had titles like The Life and Letters of Silenus or Nymphs and Their Ways or Men, Monks, and Gamekeepers; a study in Popular Legend or Is Man a Myth?"